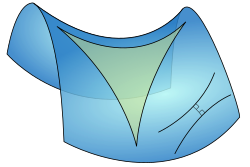 A triangle immersed in a saddle-shape plane (a hyperbolic paraboloid), as well as twa divergin ultraparallel lines. Differential geometry is a mathematical discipline that uises the techniques o differential calculus an integral calculus, as well as linear algebra an multilinear algebra, tae study problems in geometry. The theory o plane an space curves an o surfaces in the three-dimensional Euclidean space furmed the basis for development o differential geometry during the 18t century an the 19t century. Syne the late 19t century, differential geometry haes grown intae a field concerned mair generally wi the geometric structures on differentiable manifolds. Differential geometry is closely relatit tae differential topology, an tae the geometric aspects o the theory o differential equations. The differential geometry o surfaces captures mony o the key ideas an techniques characteristic o this field. This page wis last eeditit on 28 Dizember 2013, at 16:00.